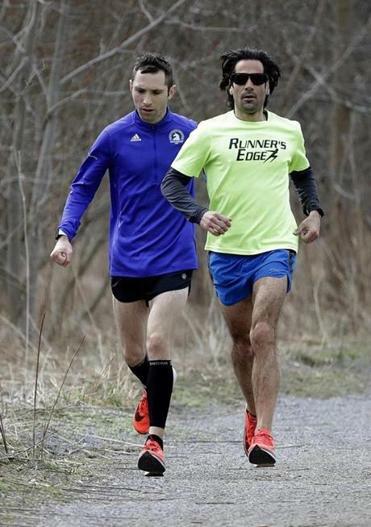 Jamie Schneider (left), 27, was accompanied by his father Allan on his workout at Bethpage State Park in preparation for this year’s Boston Marathon. Alex Schneider does everything fast. Hear him pounding on the stairs in his family’s New York home and you might fear an earthquake. Watch him wolf down breakfast and you might wonder if he tasted anything. Hear the morning alarm and give him all of 20 minutes to be up, fed, and dressed. Alex’s twin brother, Jamie, is his polar opposite, as deliberate as his sibling is hurried, intent on making things perfect before departing for anywhere. 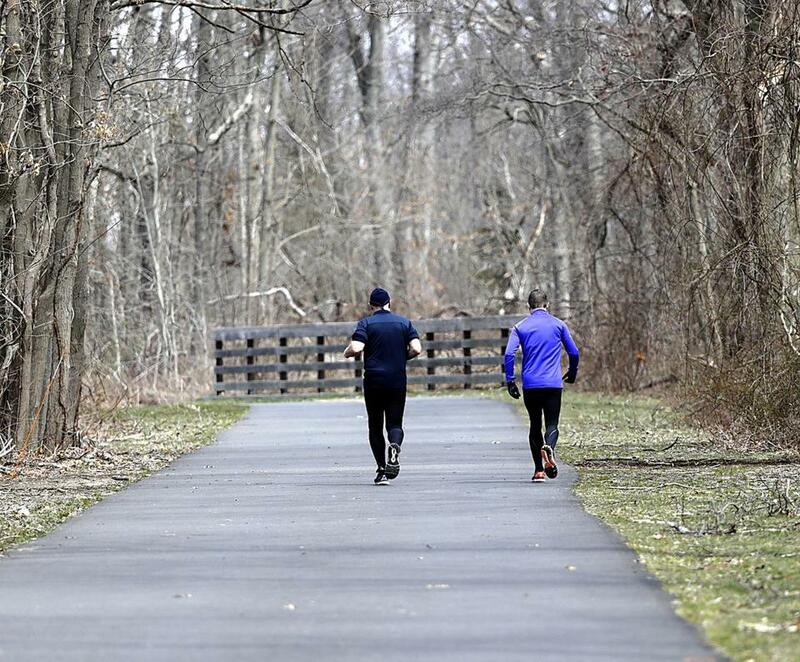 Alex Schneider (left) ran along a trail with trainer Sal Nastasi while preparing for Boston. Yet connected by the biology of shared DNA, they can be so similar, too, deeply aware of each other, feeling the other’s presence in a way an outsider could never understand. They are brothers. They are runners. They are brothers who run. They are runners who happen to be brothers. One who runs so hard and so fast he will be at the starting line in Hopkinton Monday for his fifth Boston Marathon, 18th marathon overall. One who has done eight marathons of his own but will be in Boston this time as a spectator. Both under the constant, watchful eyes of their parents, Allan and Robyn. They are also profoundly autistic. And from the moment those diagnoses were delivered, when these 27-year-old young men were but 21½-month-old boys, this family of four was thrust into a world of complete unknowns, of deep-dive research and countless doctors, of mounting questions and elusive answers, of the search for anything in the effort to connect two nonverbal, uncommunicative boys to the world around them. That running would emerge as the primary path wasn’t something Robyn and Allan Schneider could have predicted, not after trying everything from karate to gymnastics to swimming to piano. But as the devoted, loving, invested parents they vowed to be, they found it to be an activity they have embraced with their hearts, their minds, and yes, even their lungs and their legs. This year’s unforgiving conditions made the 2018 Boston Marathon a gantlet of biting rain, buffeting headwinds, and dispiriting cold. So as yet another remarkable day of long-distance running takes over the streets of Boston, meet one of the most inspiring families making its way to New England for Patriots Day, and go ahead and save one of your heartiest cheers for them. Because what this family has built around running represents the best of what we can be for our kids, a reminder of the power between physical activity and mental health, a window into a life that might seem so unlike your own, but whose core can be a model for anyone. Reading emotions in severely autistic individuals can be nearly impossible, but in running, these parents are certain about what they see. Jamie benefits in a similar way, even if he took to running in a different fashion, preferring outdoor trails and slower-paced runs with Allan. For the Schneiders, running has truly become a family affair. Allan has used it to stay ahead of a decades-plus diagnosis of multiple sclerosis, bonding with his son while also confounding doctors who expect the debilitating attack on the central nervous system to have affected him much more than it has. Robyn has used it to cope with difficult, painful radiation and chemotherapy treatments for breast cancer, bonding with her sons (she’s known to hop on her bike to keep pace with Alex) while thankfully reaching remission. Alex (left) and Jamie Schneider. 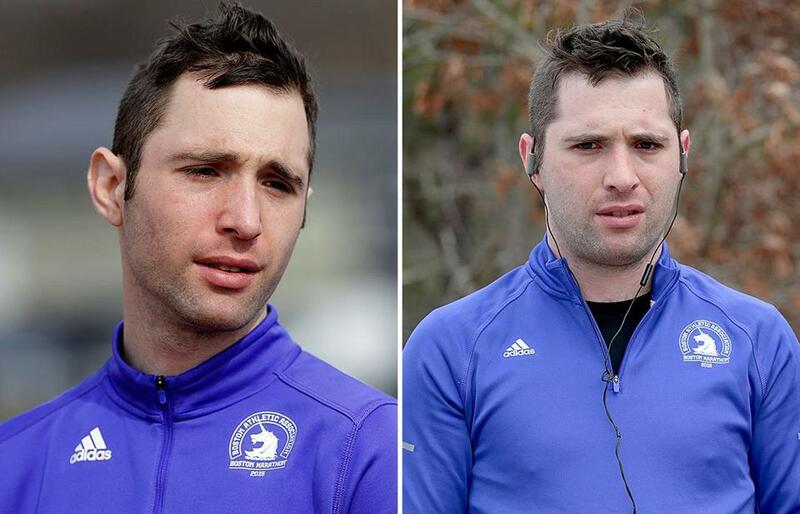 A return trip to Boston recalls how that closeness helped Allan guide Jamie through one of the toughest moments of their lives, when the tragic 2013 bombing at the race’s finish line split the family in two, keeping them separated for hours. Robyn, who’d met Alex and his running coaches/guides when they’d finished running, was back at the hotel and preparing to meet Allan and Jamie, who was still running. But when the bombs exploded, they were stopped at Mile 22, holed up in a church for hours, cold, hungry, and doing anything imaginable to keep Jamie calm. They got through the day, though a later diagnosis of catatonia necessitated further treatment for Jamie. Running would eventually return, while for Alex, it just kept getting better. A recent personal best (by nearly six minutes) of 2:50:05 at the New York City Marathon has the family excited for what can happen in Boston. “He’s really developed into an amazing runner,” Robyn said. Lucky for him, he’s always been part of an amazing family.